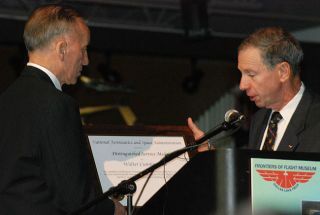 NASA Administrator Michael Griffin (right) presents Apollo 7 pilot Walter Cunningham the NASA Distinguished Service Medal. Forty yearsafter flying NASA's first manned Apollo mission, the crew of Apollo 7 washonored with the space agency's highest award, the NASA DistinguishedService Medal. The Oct. 17presentation at long-last recognized thecrew's contributions to the United States' first lunar landing program,granting Wally Schirra, Donn Eisele and Walt Cunningham the same award that allof their fellow flown Apollo astronauts received almost four decades earlier. "Forexemplary performance in meeting all the Apollo 7 mission objectives and moreon the first manned Apollo mission, paving the way for the first flight to themoon on Apollo 8 and the first manned lunarlanding on Apollo 11," NASA Administrator Michael Griffin read fromthe framed certificate that accompanied each of the medals. "Iwrote that citation myself," said Griffin, speaking before an audience ofastronauts, flight controllers, the crew's family members and friends during a privatecelebration held at the Frontiers of Flight Museum in Dallas, Texas. "Looking back ... I recognized that the Apollo 7 crew was the only onewhich did not receive a NASA Distinguished Service Medal." Apollo 7launched on October 11, 1968, just 20 months after the Apollo 1 crew - Virgil"Gus" Grissom, Edward White and Roger Chaffee - were killed in a firethat tore through their spacecraft during a ground test on the pad. Theirbackup crew, Mercury and Gemini veteranWalter "Wally" Schirra and rookie astronauts Donn F. Eisele andWalter Cunningham were assigned to the first mission of the redesignedspacecraft. "Inits day, the Apollo command module was the most complex machine ever built byman to be operated by man," explained Cunningham on Friday. "Welaunched on the longest and most ambitious engineering test flight in history,testing the spacecraft systems, verifying the operating procedures, checkingout the worldwide tracking network, and that's not to mention testing ourcrew." "Apollo7 was planned as an open-ended mission, lasting up to 11 days. Most of thecritical tests of the spacecraft systems took place in the first couple of daysbecause no one really expected the mission to last the full eleven days. Therewas simply too many opportunities for a system to fail, causing us to come homeearly, but you know that didn't happen," reflected Cunningham. Indeed,Apollo 7 was deemed to be a "101% success.? "Onthe basis of a superbly built and superbly flown Apollo 7 mission, the NASAmanagers of that era were able to make the decision, the gutsiest call thatNASA ever made and the most crucial, to send Apollo 8 to the moon," saidGriffin. With theirmission being hailed by NASA, it would seem only natural for the agency to thenaward the astronauts accordingly, both literally with medals and figuratively,in the form of future flight assignments. And that would've happened, had itnot been for Schirra coming down with a cold on the second day of the mission. Schirra soonpassed the illness to Eisele (although to a lesser extent) and while Cunninghamwould remain well (he would later write that he felt a 'little blah' by thethird day), mission control, and through it, the world, came to the belief thatthe crew as a whole had been stricken. A cold by itself wouldn't have been muchof an issue were it not that it had the unfortunate, but understandable effectof leaving Schirra short-tempered, which when coupled with the normal stress ofthe mission, led him to directly challenge flight controllers orders. Atparticular issue was the use of a TV camera - the first to be taken to space -and whether or not to don helmets for reentry. "Itmight have generated a little more controversy that the ground during flight isused to seeing today," explained Griffin. As such,instead of presenting the Apollo 7 crew with the Distinguished Service Medal,NASA gave Schirra, Eisele and Cunningham the Exceptional Service Medal. "NASAhero, second class," described Cunningham in his book "TheAll-American Boys" first published in 1977. "At the time, Donn and Idiscussed what effect Wally's bad temper in orbit might have had on the choice.There was no way of being sure, but later events left little doubt that it was indeeda factor. Every other Apollo crew, ten in all, as well as the nine people whoflew Skylab, received the Distinguished Service Medal." Readthe conclusionof FirstApollo Flight Crew Last to be Honored atcollectSPACE.com.